Here is a set of 10 ATC’s that I created and sent to a few people around the world who are part of an ATC exchange. I never thought I would like to make ATC’s as much as I do. I think its the sense of accomplishment in a very short period of time that makes it so fun to do. Since they’re so small, you don’t have to put a lot on them to make them beautiful. 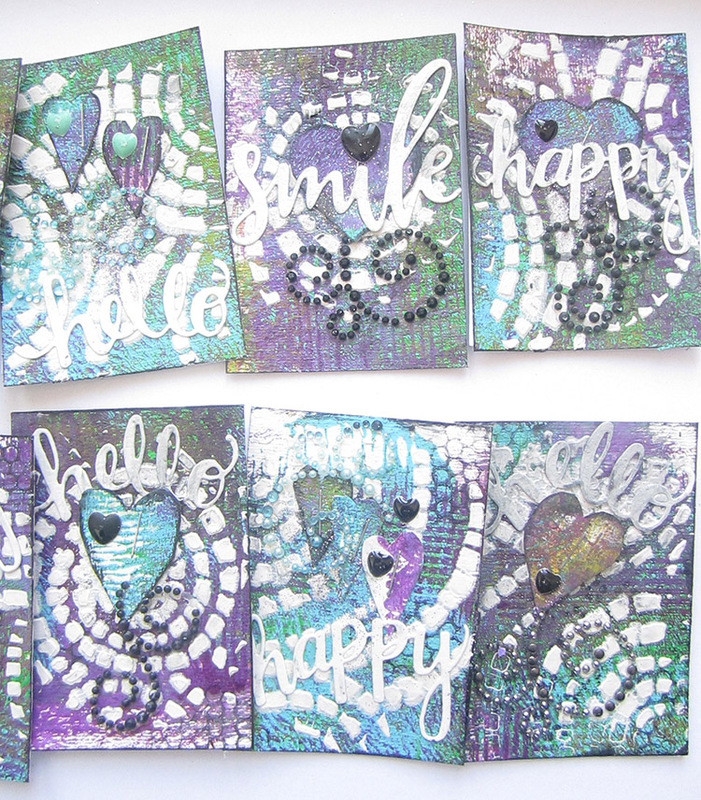 The background of these ATCs was done using a Gelli-plate. 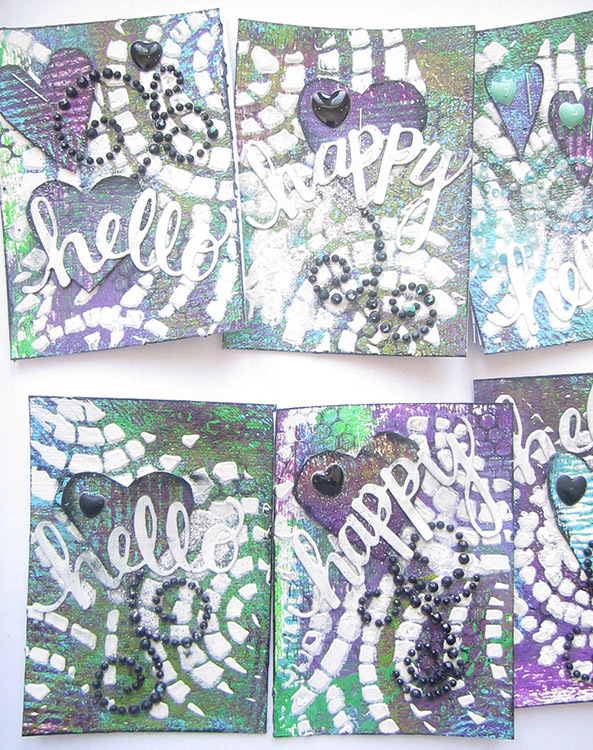 I used an 11×8.5 water-colour paper and created a fun mono-printed background using Gelli-printing. The backgrounds were created on a live show on my Ustream channel. The show was done in spanish as my audience was from South America. However I did add subtitles after it was recorded. Just press the CC subtitles button and you will have the english translation. 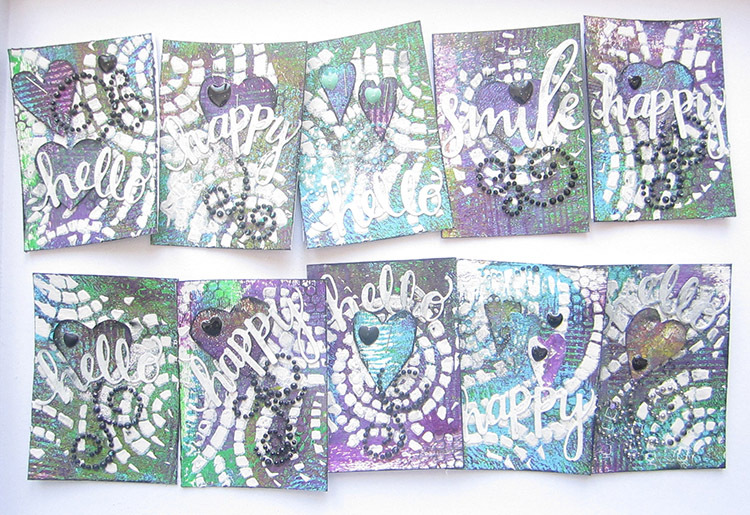 Once I cut the background into 10 ATCs, I stencilled the DecoArt Swirl stencil with white heavy gesso and added some embellishments and words. The hearts were also cut from the leftover background paper, so nothing went to waste. Scrap For Help 1 year Anniversary Blog Hop(e)!! Love the way our ATCs turned out! The colors and textures are beautiful!! Wonderful project. Love the colours.